The Great Living Chola Temples were built during the Chola rule in the south of India. Those temples include the Brihadisvara Temple at Thanjavur, the Temple of Gangaikondacholisvaram and the Airavatesvara Temple at Darasuram. UNESCO designated the Brihadisvara Temple a World Heritage Site in 1987; the Temple of Gangaikondacholisvaram and the Airavatesvara Temple at Darasuram had been added as extensions to the Great Living Chola Temples World Heritage Site in 2004. The temples display the tremendous power, wealth, imperial domain, and religious commitment of the Cholas in the cities of Thanjavur and Gangaikonda Cholapuram. Rajaraja Chola I, (r. 985 – 1015 C.E.) the great king of the Cholas, expanded the ancient capital of the Cholas, especially by building the splendid Brihadeeswarar Temple. Rajaraja Chola I's kingdom ruled South India, controlling tremendous wealth and territory. He built many temples dedicated to Lord Shiva, and improved Thanjavur's design. Rajendra Chola I, Rajaraja Chola I's son, conducted his father's military campaigns, expanding the empire throughout the Indian Ocean. To commemorate his victories, Rajendra Chola I built a new capital city in Gangaikonda Cholapuram. With the creation of the new capital city, Thanjavur declined while Gangaikonda Cholapuram ascended. Rajendra Chola I created formidable fortifications, designed the roads and city gates as well as the layout of the city. He constructed a Royal Palace and the magnificent Temple of Gangaikondacholisvara. Thanjavur (Tamil: தஞ்சாவூர்), also known by its anglicized name Tanjore, designates a city and a municipality in Thanjavur district in the Indian state of Tamil Nadu. Thanjavur serves as the capital of the Thanjavur District. The city lies on the south bank of the Kaveri River. Thanjavur had been the capital of the Mutharayars and Cholas when they stood at the peak of their power. Since then, Thanjavur has been one of the chief political, cultural and religious centers of South India. Thanjavur hosts the famous Brihadeeswara Temple, one of UNESCO World Heritage Sites. Thanjavur derives its name from Tanjan: an asura (demon) who, according to local legend, caused devastation until killed by Sri Anandavalli Amman and Sri Neelamegapperumal. The government granted Tanjan's last request, that the city might be named after him. The Thanjavur area has a rich historical heritage, embodying a center of ancient as well as the modern South Indian civilizations. The city was once the stronghold of the historic Cholas. Perumbidugu Mutharaiyar (c. 665 C.E.) ruled his kingdom with Uraiyur as the capital. Later the Nayaks of Vijayanagara and the Maratha rajas ruled it. Thanjavur contains over 90 temples, favored by the Chola rulers between the first to twelfth centuries, the Nayakas in the sixteenth century, and the Marathas in the seventeenth and eighteenth centuries. Thanjavur, or Tanjapuri, the name used in ancient times, had been chosen by the Mutharayar king and later conquered in 846 C.E. by Vijayalaya Chola. Vijayalaya built a temple for his favorite goddess, Nisumbhasudani, in the city. 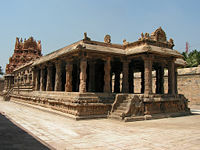 Although subsequent emperors made Kanchipuram a subsidiary capital, Thanjavur maintained its position as the chief city. Rajaraja Chola I completed the great Brihadisvara Temple around 1010 C.E. It remained the center of the Chola administration for many years, channeling the state revenue into a number of civic projects. It also acted as a repository of the empire's records, as the great Rajaraja had its walls covered with numerous inscriptions recording his conquests and his endowments to various charities. From the inscriptions one get the impression of a wealthy, progressive city, dominated by devotion to the large temple. The inscriptions tell of a number of royal palaces in the city and of the districts where palace servants lived. There are names of a number of streets: the big street of Virasola and the big market of Tribhuvanamadeviyar. During the reign of Rajaraja the city divided into two parts: Ullalai (inner) and Purambadi (outer) city. Purambadi could have been an extension to the city built during Rajaraja's reign. Two streets running east to west in front of the Brihadisvara Temple are called Northern and Southern Talichcheries counted among the new streets built by Rajaraja. People who worked in the temple occupied those streets. Other temples, such as the Jayabhima temple and Tanjai Mamani found in the inscriptions, have perished. 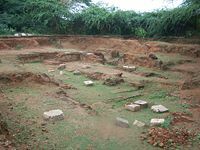 A public hospital attached to a Vishnu temple named after Sundara Chola, called Sundarachola Vinnagara Salai, endowed by Kundavai, the sister of Rajaraja Chola, had existed. The influence of Thanjavur began to diminish when Rajendra Chola I built a new city named Gangaikonda Cholapuram and moved his capital there. After the Cholas, the Pandyas conquered the Chola country. Madurai had been the Pandya capital and Thanjavur remained in the background, as a province of Vijaynagar empire. Later in 1535 C.E., the Vijaynagar king installed a Nayak king hence the era of Tanjore Nayaks which lasted till mid-seventeenth century, until conquered by the Madurai Nayaks, later falling into the hands of Marathas. The Marathas conquered Tanjore in 1674 under Venkaji, the half-brother of Shivaji the Great; his successors ruled as rajas of Tanjore. The British first came into contact with Tanjore by their expedition in 1749 with a view to the restoration of a deposed raja of Tanjore Nayak lineage. In that they failed, a subsequent expedition had been ransomed off. The Maratha rajas held Tanjore until 1799. A Protestant mission at Tanjore had been founded in 1778 by the Reverend Christian Friedrich Schwarz. His church dates from 1779. In October 1799, Raja Serfoji II, a convert of missionary Schwartz ceded absolute sovereignty over the district to the British East India Company. The raja retained only the capital and a small tract of surrounding country. He died in 1833 and his son Sivaji, succeeded him. When Sivaji died heirless in 1855, their lineage ceased. The (Tamil: பெருவுடையார் கோவில்; Peruvudaiyar Koil) designates an ancient Hindu temple located at Thanjavur in the state of Tamil Nadu, India. The temple, dedicated to Shiva, dates to the Chola dynasty rule in the Eleventh century C.E. 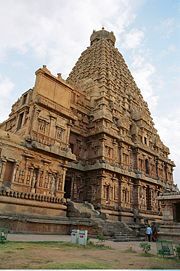 Thanjavur became famous for the Brahadeeswara Temple (or Brihadeeswara temple) built by Chola king Rajaraja Chola I, the first sailor king of India. UNESCO designated the Brahadeeswara Temple, also known as the Big Temple, a World Heritage Site. Enclosed in two courts, surmounted by a lofty tower, the temple includes the exquisitely decorated shrine of Subrahmanya. The Vijayanagar fort, which contains a palace expanded by the Maratha king Serfoji II with an armory, a Bell Tower and the Saraswathi Mahal Library, which contains over 30,000 Indian and European manuscripts written on palm leaf and paper, number among the other historic buildings. The temple construction was completed in 1009-1010 C.E. Thanjavur constitutes one of the chief political, literary and religious centers of southern India. Known for its contribution to Carnatic music, it has produced many classical musicians and Bharathanatyam dancers, emerging as the second most important site for the annual Natyanjali dance festival. The great musician Saint Tyagaraja lived in Tiruvaiyaru, situated close to Thanjavur. Tiruvaiyaru holds Thyagaraja Aradhana every year in the tamil month of 'Thai'(January end), musicians from throughout India participating. The city has become well known for its unique painting style called Tanjore Painting, a percussion instrument called the Thavil, a divine classical string instrument Veenai and the Thanjavur Dolls. The Tanjore paintings have become widely popular internationally. The artists use a combination of canvas background with glass, metals, etc. to depict and decorate various scenes from Hindu mythology. Tanjore plates made of color glass pieces, cut aesthetically and embedded on velvet cloth, has images of gods image or birds at the center. Gangaikonda Cholapuram (Tamil: கங்கைகொண்ட சோழபுரம்) had been erected as the capital of the Cholas by Rajendra Chola I, the son and successor of Rajaraja Chola, the great Chola who conquered a large area in South India at the beginning of the eleventh century C.E. It occupies an important place in the history of India. As the capital of the Cholas from about 1025 C.E. for about 250 years, the city controlled the affairs of entire south India, from the Tungabhadra in the north to Ceylon in the south. The great temple of Siva at that place stands second only to the Brihadisvara temple at Thanjavur in its monumental nature and surpasses it in sculptural quality. Rajendra Chola founded the city to commemorate his victorious march to the Ganges. The name means The town of the Chola who captured the Ganges. A small village now, its past eminence only remembered by the existence of the great Siva Temple. Rajendra undertook an expedition to the Ganges along the east coast of peninsular India c. 1022 C.E. The emperor himself accompanying the army up to the banks of the Godavari river. The Chola armies conquered all the countries north of Vengi, which included Kalinga, Odda, Southern Kosala, the lower and upper Lada and finally the Vangaladesa (Bengal). The triumphant Chola armies brought back waters from the river Ganges in golden vessels. To commemorate that celebrated victory, Rajendra assumed the title of Gangaikonda Chola and had the Siva Temple Gangakkondacholeswaram built. Soon after, he moved the capital from Thanjavur to Gangaikondacholapuram. Rajendra probably founded the city of Gangaikondacholapuram before his seventeenth year. Most of the Chola kings who succeeded Rajendra had been crowned here. They retained it as their capital, reoriented and trained the efficient Chola army. Judging from the extant literature, and the remains of the city, the city had been extensive, carefully planned and laid in accordance with the architectural treatises to suit the needs of a capital. It appears to have had two fortifications, one inner and the other outer, with the outer wider. The remains of the outer fortification appear as a mound encompassing the entire palace. The outer fortification, six to eight feet wide, had been built of burnt bricks. Consisting of two walls, the intervening space (the core) had been filled with sand. The large bricks had been made of clay baked at high temperatures. Systematic brick robbing by the local inhabitants has reduced that structure to its current state. Inscriptions mention the outer fortification, known as Rajendra Chola Madil. The inner fortification had been around the royal palace, probably identical with the Utpadi vittu madil of the inscriptions. During the reign of Kulothunga Chola I, the fortifications had been restored, the city undergoing remodeling and additions. An epigraph refers to the fort wall of Kulothunga Chola (Kulottunga Cholan Thirumadil). The strengthening of the fortification and additions to the city in the reign of Kulothunga I had been necessitated by the uprising which led to the murder of Chola king Adirajendra, Kulothunga's predecessor. The temple of Gangaikondacholisvara has its main approach through the northern entrance from the road. The passage passes through the enclosure wall and leads on to the inner court. As one steps in, the great Vimana arrests the visitor's sight. The Vimana with its recessed corners and upward movement presents a striking contrast to the straight-sided pyramidal tower of Tanjavur. As it rises to a height of 160 feet, shorter than the Tanjavur tower, and often described as the feminine counterpart of the Tanjavur temple. Small temples flank the Vimanaon either side; the one in the north, housing the Goddess, has survived well preserved. The small shire of Chandikesvara sits near the steps in the north. 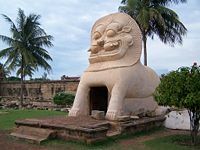 In the north-east a shire housing Durga, a well called lion-well (simhakeni) with a lion figure guarding its steps, and a late mandapa housing the office stand. Nandi, in the east, faces the main shrine. The ruined gopura, the entrance tower sits in the same direction. The main tower, surrounded by little shrines, truly presents the appearance of a great Chakravarti (emperor) surrounded by chieftains and vassals. The Gangaikondacholapuram Vimana, undoubtedly a devalaya chakravarti, stands as an emperor among temples of South India. The royal palace had been built of burnt brick. The ceilings, covered with flat tiles of small size, laid in a number of courses in fine lime mortar. 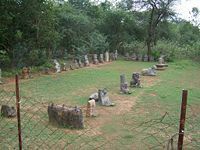 Granite bases supported the pillars, apparently made of polished wood; a few pillar bases have survived intact. Iron nails and clamps have been recovered from the palace site. During the reign of Virarajendra Chola, Rajendra's third son, the palace at Gangaikondacholapuram had been referred to as Chola-Keralan Thirumaligai (Chola Keralan palace) evidently after one of the titles of Rajendra I. The same inscription mentions a few parts of the palace as adibhumi (the ground floor), Kilaisopana (the eastern portico), and a seat named Mavali vanadhirajan. The palace had been multi-storied. An inscription dated in the 49th year of Kulothunga I (1119 C.E.) refers to Gangaikondacholamaligai at that place; more than likely, each royal having a building in their name. Besides the names of the palace and fort walls, epigraphs preserve the names of a few roads and streets. They mention the entryways named Thiruvasal, the eastern gate and the Vembugudi gate, the south gate leading to the village Vembugudi situated in that direction. Reference to highways named after Rajaraja and Rajendra, as Rajarajan Peruvali and Rajendran Peruvali, exist in inscriptions. Epigraphs mention ten streets: (Pattu teru), the gateway lane (Thiruvasal Narasam) and the Suddhamali lane. The inscription also refers to the highways, Kulottungacholan Thirumadil peruvali, Vilangudaiyan Peruvali and Kulaiyanai pona Peruvali (the highway through which a short elephant passed by). The epigraphs also refer to the Madhurantaka Vadavaru, now called the Vadavaru, running about six kilometers east of the ruined capital. Madhurntaka Vedavaru, named after one of the titles of Rajendra I, served as a source of irrigation to a vast stretch of land bordering the capital. The epigraphs mention an irrigation channel, called Anaivettuvan (destroyer of elephants). A number of small tanks and ponds mentioned in inscriptions and a number of wells, supplied drinking water to the residents. Both wet and dry lands used for cultivation and other purposes, exist inside the Fort. The present positions of the existing temples throw some light on the lay out of the city. With the palace as the center to the city, the great temple, and the other temples in the city seem to have been erected. Towards the northeast (Isanya) of the palace, the great temple of Siva stands. The Siva temple according to Vastu and traditional texts should be in the northeast of the city or village and should face east. The temple of Vishnu should be in the west. This capital of the most powerful empire in Asia at one time has become desolate; only the temple of Gangaikondachola survives. What caused the destruction of this city? The Pandyas, who put an end to the Chola empire late in the thirteenth century, avenging their earlier defeats, should have razed the city to the ground, a misfortune that fell on capitals in early times. It should have remained a heap of brick debris, the inhabitants of the nearby villages pilfering the bricks for their constructions. The people have also dug systematically deep into the ground and extracted cartloads of ancient bricks. Darasuram, a small town near Kumbakonam in Tamil Nadu state in southern India, especially known for the Airavatesvara Temple built by Rajaraja Chola II in the twelfth century C.E. Airateswara Temple - a Hindu temple located in the town of Darasuram, near Kumbakonam in the South Indian state of Tamil Nadu. This temple, built by Rajaraja Chola II in the twelfth century C.E., along with the Brihadeeswara Temple at Thanjavur, the Gangaikondacholisvaram Temple at Gangaikonda Cholapuram constitute a UNESCO World Heritage Site referred to as the Great Living Chola Temples. This temple was added to the list of Great Living Chola Temples in the year 2004. The legend states that Airavata, the white elephant of Indra, worshipped Lord Siva in that temple; so did the King of Death, Yama. Tradition states that the presiding deity, Airavateswarar, cured Yama himself (the God of Death), who suffered under a Rishi's curse, from a burning sensation all over the body. Yama bathed in the sacred tank, gaining relief from the burning sensation. Since that time, the tank became known as Yamateertham. It gets its supply of fresh water from the river Kaveri, having a width of 228 feet. Pilgrims always make a point to have a bath in the tank. Raja Raja Chola and Karikala Chola worshipped the Siva Lingam in this temple. The temple constitutes a treasure house of art and architecture and has some exquisite stone carvings. The vimana stands eighty five feet high. The front mandapam takes the form of a huge chariot drawn by horses. The temple has some exquisite stone carvings. The main deity's consort, Periya Nayaki Amman temple, situates adjacent to Airavateshwarar temple. The Cholas built the Great Living Chola Temples at Thanjavur, Gangaikonda Cholapuram, and Darasuram between the tenth and twelfth centuries C.E. and they have many similarities. Although much smaller than the Brihadeeswara Temple or the Gangaikondacholisvaram Temple, the temple has more exquisite detail. That, legend states, resulted with the builders having nitya-vinoda, "perpetual entertainment," in mind. The vimana stands 25 meters (85 ft) high. 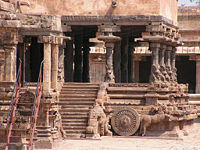 The front mandapam takes the form of a huge chariot drawn by horses. Volume II of the South Indian Temple Inscriptions deals with a number of endowments of the Pandya Kings. On the temple walls those inscriptions have been etched, revealing that the temple had been known in those days as Raja Rajeswararn and Raja Rajapuram. Two such inscriptions, copied, follow below. Inscription No. 563 at page 557. No. 23 of 1908 on the inner Gopura of the temple, right of entrance. Record dated in the 10th Year, Tai 11, of the reign of the Pandya King Maravarman alias Tribhuvana Chakravartin Srivallabhadeva registering the provision made for repairs and for celebrating festivals in the temple of XXXI Ra (ja) ra (ja) isuram Udaiyanayanar, by the residents of Uttattur-nadu, a sub-division of Kulottunga-valanadu. Inscription No. 564 at page 558. Record dated in the 31st Year, Makara, Ba. Dvitiya, Uttarashada (probably a mistake for Uttaraphalguna) of the reign of the Chola king Tribhuvana Ghakravartin Sri RAJARAJADEVA registering the grant of land (Irandu Ma mukkani araikkani) 23/160 of a veli to meet the expenses of worship, offerings, etc., to the God by a native of Peruchchalipuram, a village in Kilar-kurram, a sub-division of Pandyakulapati-valanadu. As originally Airavata worshiped the Lingam, the Lingam has been named after him as Airavateswara. 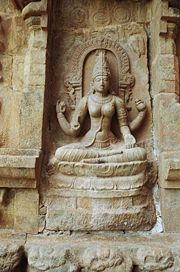 The Goddess in that temple had been known as Deva Nayaki. The remains of the sculptural part of the temple, on the inside wall of the outer prakaram, stands about a foot from the floor level. The carvings contain different poses of gymnastic feats seen in modern circuses, showing females keeping their head at the center and legs interwoven in such a skillful way as to form the circumference of a circle. It may be a depiction of the present-day gypsy tribe entertaining villagers with skillful gymnastic shows and dancing poses. Such gypsies still visit the interior villages of the country. Very many styles of physical feats shown by both men and men have been carved a stone. All the dancing poses of Bharatanatyam have been carved a stone. A carving showing the village womenfolk helping in another woman with her delivery, both her hands on the shoulders of the two ladies, pressing their hands and the abdomen of the lady to help her deliver. Those constitute skillful and artistic works of superb style. That provides a glimpse into the social conditions of the past. 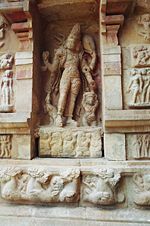 The stone image of Ravana carrying Kailas constitutes a fine specimen of workmanship. At the entrance to the temple, two Dwarapalakas, Sankhanidhi and Padmanidhi, stand imposingly, giving vivid anatomical expressions of the exuberance of youth. In front of the temple, a small mandapa sits, reached by three steps in the form of a ladder. The steps, made of stones, give different musical sounds when tapped. All the seven swaras can be had at different points. Village children enjoy playing with the stones, raising concern about the need to protect the national treasure. ↑ Brahadeshvara Temple. Retrieved February 27, 2015. ↑ More details on this temple can be found at TemplePages.com Retrieved January 10, 2008. ↑ Great Living Chola Temples - UNESCO World Heritage Centre Retrieved March 13, 2015. All links retrieved July 13, 2017. Photos of Thanjavur Periya Kovil. Buried in Time: Maligai Medu. History of "Great Living Chola Temples"
This page was last modified on 13 July 2017, at 16:37.